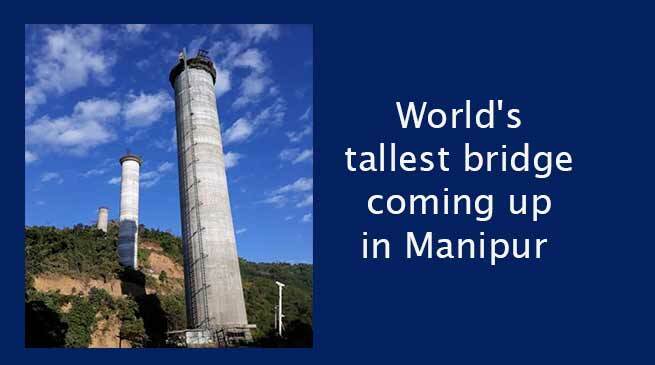 N.F.Railway Construction Organisation has recently achieved a major advancement in constructing the world’s tallest bridge coming up near Noney (Manipur). It is indeed a matter of profound joy that N F Railway/Construction organisation has successfully crossed the 100 mts. mark, making it India’s tallest pier. The Bridge is a part of Jiribam-Tupul-Imphal new BG line project (111 Km). The project picked up momentum in the last 3 years due its importance as National Project. There are total 45 tunnels in the project. The longest tunnel i.e., Tunnel No. 12 with a length of 10.280 Km. will be the longest railway tunnel in the Northeast. The bridge is being constructed across the valley of river Ijai near Noney with a pier height of 141 mt. It will surpass the existing record of 139 mt. of Mala-Rijeka viaduct, Montenegro in Europe. The total length of the bridge will be 703 mt. The piers of the bridge are constructed using hydraulic augers, the tall piers needed specially designed “ slip-form technique” to ensure efficient and continual construction. “Self-erecting” electric lifts at each pier cater to the safe and speedy conveyance of men and materials to the top. The steel girders are pre-fabricated in a workshop, transported in segments and erected at site by Cantilever launching scheme.